Scuderia Ferrari probably got the most they could out of a difficult Sunday at Hungaroring with Sebastian Vettel finishing second and Kimi Raikkonen third. However, there has to be a question mark about what might have been if no hesitation at the pit stop or if it hadn’t rained on Saturday afternoon. Despite all this, the SF71H continues to show its strength and anticipates an interesting second part of the season after the summer break. Raikkonen started the Hungarian GP from third on the Ultrasoft tyres and behind him, Vettel was the only driver in the top four to opt for Softs, which would offer less performance at the start but would last longer. It was a normal start up to turn 2 when Vettel went round the outside of his team mate, from which point on he had to manage his pace. The Finn was the first to pit, coming in on lap 15 for Softs, with Mercedes' Valtteri Bottas covering the move next time round. After 20 laps, Vettel began to step up the pace with the aim of pulling out a big enough lead over Bottas in order to stay ahead after the pit stop. That brought down the gap to Hamilton who pitted on lap 26, fitting the Softs. Vettel continued to gain on Bottas and therefore stay on track. Raikkonen was also catching his fellow countryman, having lost a bit of time at the pit stop while tyre debris was cleared out of the brake duct. After 33 laps, Raikkonen was now in DRS distance of Bottas. On lap 39, the Ferrari mechanics stepped out into the pit lane to fit another set of the yellow banded tyres for Raikkonen. “The start was ok, I got a tow and I was deciding which side I should go; but then Bottas moved the same side, trying to block me, so I braked earlier and lost the position to Sebastian. After that it was all about trying to get some free air and use the speed I had, giving myself a hard time in trying to to put pressure on the others and not being able to save the tires," Raikkonen explains. "The race went by pretty quick, we were pushing through the whole race with decent tires all the time because of the two-strategy stops we had. The fact of not having my drink bottle available was obviously not ideal, but not so much of an issue either. Vettel went for the Quali tyres, the purple-banded Ultrasofts, but the stop took longer than planned and the SF71H emerged behind Bottas who had significantly upped his pace. The two men duelled on track and now the main concern was not attacking, but not staying too close to the car in front in order to control the brake temperatures. In the last 20 laps, the number 5 car closed up again before a Virtual Safety Car was needed after Stoffel Vandoorne stopped on track. 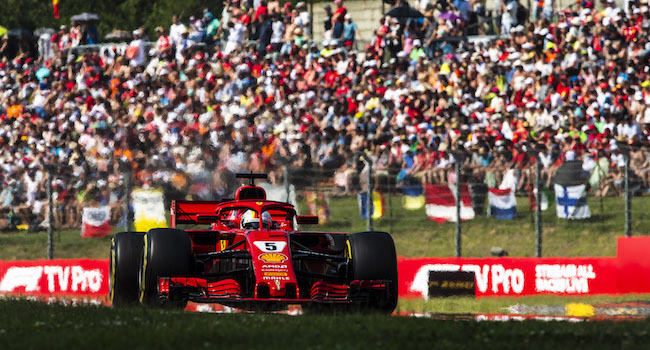 As the race resumed, Vettel’s Ultrasofts were still in great condition, but after Monaco, the Hungaroring is the worst track for those who enjoy watching overtaking moves. By now, Raikkonen had closed right up on these two, which on any other track would have been the prelude to some thrilling action. On lap 65 Vettel made a bold move down the outside, taking the inside line through turn 2 to go ahead of Bottas, who, in trying to defend his position, hit the Ferrari damaging his front wing, which meant Raikkonen was able to slip by. The race had turned around but too late to aim for the top position. “Today we were fast in the first stint, but at the end I was a little bit disappointed because I had lost 3 or 4 seconds in the traffic," said Vettel. "The pit stop we did was not ideal either, as we lost some time there. Then it was very hard, when I was running close to Valtteri and trying to overtake him. However, at the end I knew I could be faster than him thanks to my tires, which were fresher. However, we tried everything we could and I think second position is the best result we could get today. I think there’s a lot of things we did well and some others not that much, but that’s part of the game.